In 2013, R Narayan, founder and CEO of Power2SME, was in Mumbai for a meeting with a top VC firm which had recently made huge investments in numerous start-ups. Discouraged with his recent meetings with other investors, Narayan was specially looking forward to this one. But he was disappointed. "We are only interested in investing in B2C (business-to-consumer) models," Narayan was told by the investor at the Bandra Kurla Complex. Today, Narayan's Power2SME, an online buying club for small and medium enterprises, is one of the top funded business-to-business (B2B) start-ups in India. However, to get five people to invest in his start-up, he had to meet more than 100, he says. "When we started out, B2B was not an attractive space to be in. In 2015, when we met people, all of them asked whether we were doing something in food delivery or local services or logistics," recounts Rahul Garg, Founder of Moglix, a B2B commerce company. But, a shift is under way. Investors who have turned cautious after their recent misadventures with start-ups are looking for safer bets. 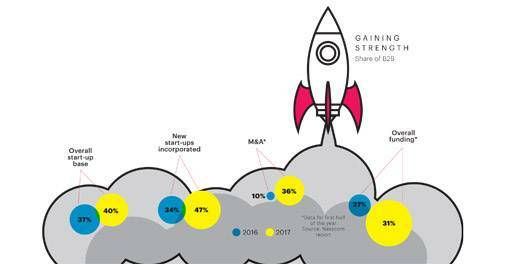 Year 2017 proved to be a game changer for B2B start-ups in India. A report by industry body Nasscom says that in 2017, of the 1,000-plus new additions to the Indian start-up ecosystem, almost 50 per cent were in the B2B segment, up from 34 per cent in 2016. The report also claims that the average funding for B2B start-ups rose 5 per cent in 2017, while the B2C average funding saw a decline of 10 per cent. One factor behind the attraction of B2B start-ups is that they are less capital intensive than B2C start-ups, the report states. Fintech, health-tech and B2B enterprise products are driving the segment, with increased focus on technologies such as analytics, artificial intelligent, Internet of Things, augmented reality or virtual reality, and Blockchain, among others. In 2017, about 26 per cent B2B funding ($145 million) poured into enterprise and SMB-focused horizontal solutions, 90 per cent of which was in software-as-a-service. While valuations of these companies are still not as high as that of top-valued consumer-focused start-ups, some of which are valued at a billion dollars, B2B start-ups have gained sure footing in the ecosystem. According to data from start-up analytics firm Tracxn, the top 35 B2B start-ups in India have raised a total of $677.09 million since November 2016. The top valued firm is JustBuyLive, an e-distributor that connects shopkeepers with consumer brands. It had raised about $100 million from Ali Cloud Investment (as of February 2018). B2Bs have shown a fair bit of innovation, something that top-valued consumer start-ups lack. For instance, one of the investors in Uniphore, which has built a speech recognition software, is John Chambers, former CEO of Cisco Systems, who recently picked up a 10 per cent stake in the company. Another example is CapitalFloat. Its co-founder and MD, Gaurav Hinduja, says they were the first ones in India to think about lending online to SMEs. "Though there was a lot of scepticism about the idea initially, today the segment had many players," he adds. Some B2B start-ups had better luck and did not face as many funding issues as others. "We did have to make an effort to raise funds but I don't think I have met investors who have been unreasonable. We got the right set of investors on board," says Manish Patel, the reticent CEO of Mswipe, a mobile point of sale-based payment enabler. Some of the B2B bets have paid off. Data from Tracxn shows that out of the top 10 players, three are already profitable. Sahajanand Medical reported a revenue of Rs 100 crore, and a net profit of Rs 16 crore, in FY16; NeoGrowth reported a revenue of Rs 138 crore and a net profit of Rs 6 crore in FY17; and sales readiness and enablement platform MindTickle had a revenue of Rs 24 crore and a net profit of Rs 2 crore in FY17. In contrast, many top B2C start-ups in India, such as Zomato, BigBasket and Snapdeal, are struggling to be profitable. The interest in B2B start-ups is not sudden, though the B2C underperformance helped tilt the scales. "We are seeing a lot of start-ups coming up in the B2B space, primarily because B2C is a tough market to be in," says Ganesh Raju, Partner and Leader, Start-ups, PwC. Investors are looking at companies that have healthier financials and need less capital to grow. "In B2B, you don't have to spend millions of dollars on customer acquisition and you don't have marketing costs. So, in an environment where funding is available but cautious, focus is on solid businesses with better economics," says Sumit Jain, Partner, Kalaari Capital. The VC has invested in several B2B companies such as mobile data company Active Intelligence, B2B online commerce portals Industrybuying and Power2SME, fintech platform CreditVidya, etc. While larger funds are still hesitant, the smaller ones are going full steam ahead. Karthik Reddy, MD of Blume Ventures, is perhaps one of the few investors in India who has always believed in the potential of B2B start-ups. The seed-stage venture fund, even in its initial days (2010), had put 45 per cent of its money in B2B start-ups. "You don't have to throw $2 million to just understand whether you are addressing the right problem or not. In these start-ups, you realise very early on whether the business is sustainable or not, as the first step is building revenue. And all of this happens with a very low cost burn," he adds. The picture is not all rosy though. In 2015, Satish Gupta, Ankur Majumder and Siddharth Arora realised how unorganised the truck industry was in India. 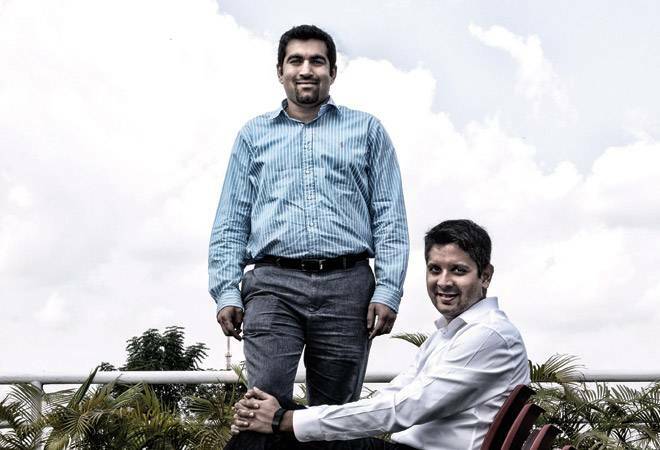 The trio decided to start a truck aggregator, and launched Turannt in 2015. However, many others launched similar businesses and while most of them got seed funding, later investments did not come, and most of them, including Turrant, shut down. It's the same story in food-tech, e-commerce and a few other segments in which several start-ups emerged together. B2B, too, has fallen prey to this problem. The space is crowded with fintech firms, e-commerce companies and agriculture marketing platforms. Not only has this increased competition, it has also made raising capital a challenge. Most B2B start-ups find it difficult to raise money beyond the first round because investors are doubtful about scalability and don't want to be in a situation where they are not able to exit. "B2B usually doesn't scale up virally the way consumer focussed-businesses do and eventually, when you go to sell these businesses, the judgement on valuation will depend on metrics such as PE ratio and revenue multiples. Companies have to look as if they have a certain scale; only then will somebody be interested in buying them, and then you will get your exit," explains Reddy. Some B2B start-ups also have a hard time attracting talent, while others are still trying to get a foothold in B2B supply, a segment that has not seen innovation in many years. While there is no data available on the number of B2B start-ups that have shut down operations in the past few years, most of those that have closed, such as Prophesee, Truckmandi, Intelligent Interfaces, Tolexo, Buildzar, Zippon and Omnikart, cite lack of funding as the main reason. Experts are divided on the opportunity that the B2B space presents for growth. While some say that such start-ups can never grow as big as consumer-facing companies, others think their potential is huge. "All the top companies in the world are consumer-facing. There is a limit to how big B2B start-ups can become," says Raju of PwC. However, experts do agree that the outlook for B2B start-ups is positive in the short run as there is a dearth of companies catering to businesses in India and offering out-of-the-box solutions. And some of these could move to other countries to scale up, after gaining some ground in India. "Look at just the MRO (maintenance, repair and overhaul) opportunity in India. If two-four start-ups in India build all of this together under one umbrella and make it efficient, just imagine the impact this can have on businesses. There is hope for building very large companies out of India, just for serving Indian businesses," says Jain of Kalaari Capital. But a roadblock that B2B start-ups need to address first is lack of interest from big global investors. Given the innovation taking place in this segment, they may well be able to overcome this difficulty.